Well not random perse, but many weird and wonderful thoughts come to the fore when I go out to apply a bit of finesse to the aspects of my riding that are on my to-do-list. So in the past couple of weeks I've been venturing out on short trips, as and when time permits, not to mention when the weather has been somewhat co-operative. The joys of shift work means that sometimes I trundle out early on a Tuesday morning, have the back roads more or less to myself, get home around midday, then snooze for an hour or three before going on the first night shift. The commentary of hazards etc is kinda funny though, not that I'm adding anything to my riding here as such, for I also find myself commenting quite a bit on the actions (or inactions) of other motorists as part of this. If I hadn't already driven and ridden a few million clicks, this might be where I'd get rather miffed at seeing the "opportunities to improve" in other road users. But hey, my focus is for me to become the best rider I can be, so let's start with myself. 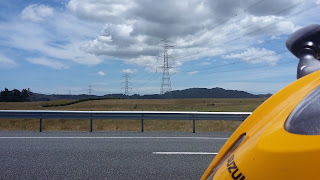 Overtaking was not a big deal to me, as I'd already worked out by means of self assessment, that just using the power of the bike would see me doing higher speeds than strictly necessary. So adopting the correct technique keeps speed differentials sensible, and yet I can still duck past slower vehicles with ease. Referring to sitting behind someone who's doing 75, with me in third, brings to the fore the old joke of remember to pull out before opening the taps...lest one becomes a bumper sticker. In the run into the summer months, taking into account that I ride year round, it's very obvious when one encounters a part time or returning rider on the road. That tentative approach to corners, the tailgating of cars before overtaking, and any number of indicators of a poor technique. Makes me wonder how we can encourage this type of rider to seek further instruction/coaching. Also made me cringe when some years back, I mentioned to one of my colleagues who also had a bike, that I was lined up to go thru a set of courses with Prorider. The sheer derision I copped for doing some courses, when by his thinking I'd been riding for ages already, so couldn't learn anything anymore...wow! And all this on top of him sneering at me when I suggested politely he could do with some finessing of his skills, after all 2 spills in one year would suggest an opportunity to improve?? Oh well, the festive season will get into full swing in the next day or so, back to this topic in the new year. Was cruising along Tourist Rd around the back of Clevedon and this vista captured my imagination. How long before we'll be riding electric bikes? Good man! More structured commentary practice to come very shortly :-). My experience with Roadcraft is almost identical to yours with regard to being in control of situations. It comes back to that short sentence describing Roadcraft of giving you more time to make good decisions. Hence, giving a feeling of better control. Of course Geoff, I'm not unique in this learning journey and as such would expect a lot of the members to have very similar stories to tell. Looking forward to making good progress in the new year.